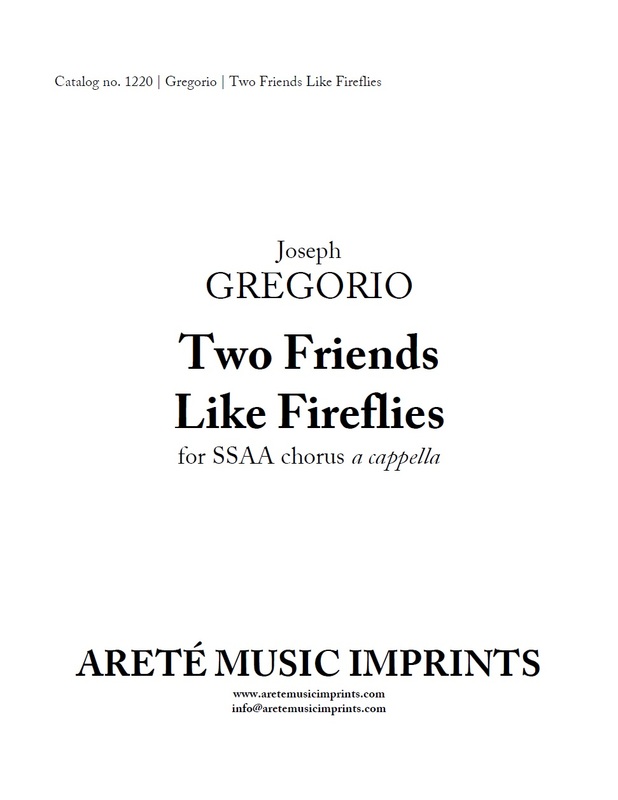 Welcome to the online home of Areté Music Imprints, where you can see, hear, and purchase music of composer Joseph Gregorio. New scores are often added; check back frequently for new offerings! Sign up for the newsletter at the bottom of the page to be kept informed about new publications. Recent additions to Areté's catalog include To My Brother (TTBB), commissioned and premiered by Cantus; Two Friends Like Fireflies (SSAA), commissioned by the 2015 ACDA Women's Commissioning Consortium; and Go Out With Joy (SATB divisi), commissioned by the University of Dayton Chorale. To hear a performance of Two Friends Like Fireflies, scroll to the 23:00 mark in the video to the left. Commissioned by the 2015 ACDA Women's Commission Consortium, Two Friends Like Fireflies sets the eponymous poem of Syrian-American poet Mohja Kahf. The text is an ode to friendship inspired by two women who, once introduced to each other by Dr. Kahf, overcame a generational divide and differing backgrounds and ethnicities to find much common ground and, through conversation, arrive at many profound insights about life. SSAA. 8.5"x11". Duration approx 5'.